Magic is a performing art that entertains an audience by creating illusions of impossible or supernatural feats, using purely natural means. These feats are called "magic tricks," "effects," or "illusions." Magic alternatively refers to acts of sorcery involving attempts to control the natural world by mystical, paranormal, or supernatural means. An artist who performs magic as illusion or entertainment is called an illusionist or a magician, just as those who perform sorcery also are called magicians. The terms "magic" and "magician" throughout this article will refer to entertainment magic and entertainment magicians. Magicians (or magi) are also referred to by names reflecting the type of magical effects they typically perform, such as prestidigitators, conjurors, illusionists, mentalists, ventriloquists, and escape artists. Illusionists have been popular as entertainers throughout history. They have maintained great secrecy about their art, revealing their tricks only to trusted apprentices. The illusionists' strict code appears justified by the fact that there exists some danger in their acts, as evidenced by many of their number suffering serious, even fatal, accidents. Equally, misuse of their secrets for personal gain with little entertainment value cheapens their craft. Illusionary magic, including prestidigitation or sleight of hand, is the art of entertaining an audience by performing illusions that baffle and amaze. The practitioners of this art of mystery may be called "magicians," "conjurers," "illusionists," or "prestidigitators." Artists in other media such as theater, cinema, dance, and the visual arts increasingly work using similar means but regard their magical "techniques" as of secondary importance to the goal of creating a complex cultural performance. As entertainment, illusionists use psychological deceptions and manipulative methods to perform feats that are apparently in violation of natural law. Sleight of hand and complicated secret mechanical apparatuses help to convince witnesses that they have just seen the magician perform the impossible. The term "Magic" is etymologically derived from the Old Persian word Magi. Performances one would now recognize as conjuring have probably been practiced throughout history. As early as 2700 B.C.E., the Ancient Egyptian magician Dedi performed a trick where he decapitated two birds and an ox, then restored their heads. Other Egyptian magicians were known for their skill at slight of hand tricks involving cups and balls. The same level of ingenuity that was used to produce famous ancient deceptions such as the Trojan Horse would also have been used for entertainment, or at least for cheating in gambling games. However, the profession of the illusionist gained strength only in eighteenth century, and has enjoyed several popular vogues. Successful magicians have become some of the most famous celebrities in popular entertainment. Jean Eugène Robert-Houdin, the first modern magician. From 1756 to 1781, Jacob Philadelphia performed feats of magic, sometimes under the guise of scientific exhibitions, throughout Europe and in Russia. 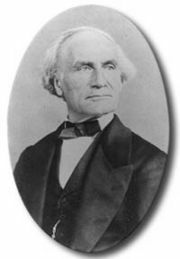 Modern entertainment magic owes much of its origins to Jean Eugène Robert-Houdin (1805-1871), originally a clockmaker, who opened a magic theater in Paris in the 1840s. His speciality was the construction of mechanical automata which appeared to move and act as if they were alive. The British performer J N Maskelyne and his partner Cooke established their own theatre, the Egyptian Hall in London's Piccadilly, in 1873. They presented stage magic, exploiting the potential of the stage for hidden mechanisms and assistants, and the control it offers over the audience's point of view. The greatest celebrity magician of the nineteenth century (or possibly of all time), Harry Houdini (real name Ehrich Weiss, 1874-1926), took his stage name from Robert Houdin and developed a range of stage magic tricks, many of them based on escapology (though that word was not used until after Houdini's death). In addition to expanding the range of magic hardware, showmanship and deceptive technique, these performers established the modern relationship between the performer and the audience. In this relationship, there is an unspoken agreement between the performer and the audience about what is going on. Unlike in the past, almost no performers today actually claim to possess supernatural powers (although there are exceptions to this, and they are regarded as charlatans). 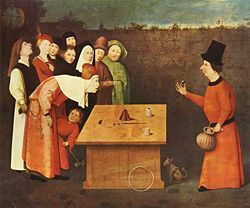 It is understood by everyone that the effects in the performance are accomplished through sleight of hand (also called prestidigitation or léger de main), misdirection, deception, collusion with a member of the audience, apparatus with secret mechanisms, mirrors, and other trickery (hence the illusions are commonly referred to as "tricks"). The performer seeks to present an effect so clever and skillful that the audience cannot believe their eyes, and cannot think of the explanation. The sense of bafflement is part of the entertainment. In turn, the audience plays a role in which they agree to be entertained by something they know to be a deception. Houdini also gained the trust of his audiences by using his knowledge of illusions to debunk charlatans, a tradition continued by magicians such as James Randi, P. C. Sorcar, and Penn and Teller. Magic has come and gone in fashion. For instance, the magic show for much of the twentieth century was marginalized in North America as largely children's entertainment. A revival started with Doug Henning, who reestablished the magic show as a form of mass entertainment with his distinctive look that rejected the old stereotypes and his exuberant sense of showmanship that became popular on both stage and numerous television specials. Today, the art is enjoying a vogue, driven by a number of highly successful performers such as David Copperfield, Lance Burton, Penn and Teller, Derren Brown, Barry and Stuart, Criss Angel, Dorothy Dietrich and many other stage and TV performers. David Blaine is sometimes included in this category, though his major performances have been more a combination of Houdini-style escape tricks and physical endurance displays than the illusion magic performed by others. The mid-twentieth century saw magic transform in many different aspects: Some performers preferred to renovate the craft on stage—such as The Mentalizer Show in Times Square which dared to mix themes of spirituality and kabbalah with the art of magic—others successfully made the transition to TV, which opens up new opportunities for deceptions, and brings the performer to huge audiences. A widely accepted code has developed, in which TV magicians can use all the traditional forms of deception, but should not resort to camera tricks, editing the videotape, or other TV special effects—this makes deception too "easy," in the popular mind. Most TV magicians are shown performing before a live audience, who provide the remote viewer with a (sometimes misleading) reassurance that the effects are not obtained with the help of camera tricks. Many of the basic principles of magic are comparatively old. There is an expression, "it's all done with smoke and mirrors," used to explain something baffling, but contrary to popular belief, effects are seldom achieved using mirrors today, due to the amount of work needed to install it and difficulties in transport. For example, the famous Pepper's Ghost, a stage illusion first used in nineteenth century London, required a specially built theatre. Harry Houdini led the field of vanishing large objects, by making an elephant disappear on stage, although not using mirrors, and modern performers have vanished objects as big as the Taj Mahal, Statue of Liberty, and the Space Shuttle, using other kinds of optical deceptions. The magician pulls a rabbit from an empty hat; a fan of cards from "thin air;" a shower of coins from an empty bucket; or appears in a puff of smoke on an empty stage; all of these effects are "productions," where the magician produces "something from nothing." The magician snaps his fingers and a coin disappears; places a dove in a cage, claps his hands, and the bird vanishes including the cage; stuffs a silk into his fist and opens his hands revealing nothing, or waves a magic wand and the Statue of Liberty magically "goes away." A "vanish," being the reverse of a production, may use a similar technique, in reverse. The illusionist pulls a red handkerchief through his fist twice, which suddenly turns blue on the third pass. A spectator is shown a penny to hold in a closed fist. After squeezing it tightly, it miraculously becomes a dime in the spectator's hand. A magician requests a volunteer to "pick a card, any card" from a deck. With a flourish the magician shows the card to the volunteer and asks "is this your card?" It is not the right card, but the magician tells the volunteer, "here, hold it for a second," handing them the card and then picking card after card from the deck, none of which is the card the volunteer picked. The magician asks, "will you look at that first card again?" whereupon the volunteer finds the card in their hand to have magically become their card. A rope is cut into two pieces, the two pieces are tied together, and the knot mysteriously vanishes, leaving one unbroken piece of rope. A newspaper is torn to bits. The magician rubs the pieces together and the newspaper becomes whole. A woman is sawn into two separate parts and then magically rejoined. A card is torn in fourths and then restored piece by piece to a normal state. "Restorations" put something back into the state it once was. A "teleportation" transfers an object from one place to another. A coin is vanished, then later found inside a tightly bound bag, which is inside a box that is tied shut, inside "another" box, which is in a locked box—all of which were on the other side of the stage. The magician locks his assistant in a cage, then locks himself in another. Both cages are uncovered and the pair have magically exchanged places, creating a "transposition": a simultaneous, double teleportation. The magician "puts his assistant into a trance" and then floats him or her up and into the air, passing a ring around his or her body as proof that there are 'no wires' supporting them. A close-up artist wads up your dollar bill and then floats it in the air. A playing card hovers over a deck of cards. A penny on an open palm rises onto its edge on command. A scarf dances in a sealed bottle. "Levitations" are illusions where the conjurer "magically" raises something into the air. "Penetration" is when one solid object passes through another, as in such old standbys as "the Linking Rings" (a magical effect the magician creates by seemingly passing solid steel rings through one another) and "Cups and Balls" (in which the balls appear to pass through the bottom of an inverted cup to the table below). Of course, there are tricks that may not fit neatly into one of the above categories. Some more complex illusions may fall into several categories. Others, like a magician's escape from a straight jacket or a locked box, may be loosely categorized as "penetration" or "teleportation," but may also be considered a category all their own. Born in 1861, William Robinson stole the persona of Chung Ling Soo, and became known as "the marvelous Chinese conjurer," one of the most famous magicians in England. Unable to smoothly deliver the vocal patter during an act, Robinson had found success with an act he performed in silence, claiming not to speak English. The real Chung Ling Soo, arriving in England years later, was accused of being a fake. In 1918, Robinson met his demise during a trick where he caught two bullets in his teeth; something went wrong, and a real bullet was fired at him, piercing his lung. Born in 1874, Harry Houdini is perhaps best known for his abilities as an escape artist. The son of a Hungarian rabbi, he was genuinely highly skilled in techniques such as lock picking, but also made full use of the whole range of conjuring techniques, including fake equipment and collusion with individuals in the audience. He performed seemingly miraculous escapes from ropes, handcuffs, and straight jackets, and was famous throughout the world for feats like escaping from a locked, submerged box in which he was shackled. Houdini's show business savvy was as great as his performing skill. Later in his life, Houdini campaigned vehemently against frauds perpetrated by Spiritualist mediums. He died in 1926, from peritonitis after being unprepared for a punch in the stomach taken as part of his act. There is a Houdini Museum dedicated to him in Scranton, PA.
Born in 1885, Harry Blackstone was one of the most prominent illusionists of the twentieth century. He performed large scale effects, charming audiences with disappearing horses, levitation, and buzz sawed assistants, as well as smaller scale tricks like floating light bulbs and dancing handkerchiefs. His legacy was continued by his son, Harry Blackstone Jr., who worked with his father, and later became a famous magician in his own right. Born David Seth Kotkin on September 16, 1956, David Copperfield is a multi-Emmy Award winning, American magician, and illusionist best known for his combination of illusions and storytelling. His most famous illusions include making the Statue of Liberty "disappear," "levitating" over the Grand Canyon, and "walking through" the Great Wall of China. He is also the founder of Project Magic, a rehabilitation program to help disabled patients regain lost or damaged dexterity skills. There are many types of magic performances. Some magicians work "close-up" magic, using playing cards or coins, performed close to the audience. This type of magic is often performed for smaller audiences, at dinner parties, or on the street. Others perform on a stage for larger audiences, or at night clubs and comedy clubs for medium-sized audiences. Performers like David Copperfield perform in large auditoriums, often creating large-scale effects using elaborate props. In one famous example of such "stage magic" Copperfield appeared to make the Statue of Liberty vanish in front of both a live and television audience. Some magicians are well-versed in mentalism, the apparent ability to read thoughts, predict events, or other abilities generally associated with clairvoyance. Magic has also been tailored to specific audiences: children's magic is common entertainment for children's parties, and corporate magic helps liven up business presentations and product launches. Since ancient times, humanity has been fascinated with the art of the illusionist, and such acts continue to be popular with audiences. Venues like Las Vegas have offered a number of famous, large budget magic acts, including, until tragedy struck in 2003, Sigfried and Roy, proving once again that the art of illusion is not without its risks. Television specials and biographies on famous illusionists also continue to be popular with audiences. Entertainment magicians can be found everywhere from television to club venues to wedding receptions, and humanity continues to be fascinated. The teaching of performance magic was once a secretive art. The success of an act is dependent on maintaining illusion, and professional magicians have often been unwilling to share knowledge with anyone outside the profession to prevent their secrets from becoming known. This made it difficult for an interested apprentice to learn more than the basics of the art. Some organizations of magicians have had strict rules against members discussing magic secrets with anyone but established magicians. From the 1584 publication of Reginald Scot's Discoverie of Witchcraft until the end of the nineteenth century, only a few books had helped budding magicians to learn the craft. Books remain useful today, but for the modern student, a DVD or video recording surpasses a book, letting the apprentice mimic the master, following along as the magician dissects presentation and performance of latter-day versions of ancient artistry. Magic clubs, workshops, and organizations like the International Brotherhood of Magicians, which publishes a monthly journal, The Linking Ring, help magicians come together and discuss their trade. Membership in such organizations often requires a solemn commitment to the "Magician's Oath," where magicians must promise never to reveal the secrets of any illusions to non-magicians, as well as only performing practiced illusions. In modern illusory magic, it is not considered fully honest to give a performance which claims to be anything other than a clever and skillful deception. Some performers have capitalized on popular belief in ESP and other paranormal phenomena as a way of presenting magical effects; Uri Geller, for example, claimed to be able to bend spoons through paranormal means. There are also, however, dishonest performers who use the techniques of entertainment magic for fraudulent goals. Cheating at card games is an obvious example, and is no more than a form of theft. During the height of the vogue for spiritualism and the wave of popularity for séances in the late nineteenth century, many fraudulent mediums used techniques of entertainment magic to perform illusions at séances designed to convince those present of actual supernatural events, for financial gain. The great escapologist and illusionist Harry Houdini devoted much of his time to exposing fraudulent mediums. Spiritualists and mediums at work today tend to shy away from effects such as making knocking sounds in darkened rooms, and objects apparently moving without being touched, as these were devices often used in the past by fraudulent practitioners. Many con artists use simple magician's effects to defraud the innocent. The three card ruse known as "Find the Lady" or "Three-card Monte," is an old favorite of street hustlers and con men who sucker the victim into betting on what seems like an easy and obvious "game." Another example is the "shell game," in which a pea is hidden under one of three walnut shells subsequently shuffled around the table (or sidewalk) so slowly as to make the pea's apparent position only seemingly obvious to the victim. Although these are well known as frauds, some people are willing to lose money on them just for the entertainment value. There are other street hustles that use illusion magic techniques and methods such as misdirection to commit theft. ↑ Henning Nelms, Magic and Showmanship: A Handbook for Conjurers (Mineola, NY: Dover Publications, Inc, 2000). ↑ Jim Steinmeyer. "A New Kind of Magic," in Hiding the Elephant: How Magicians Invented the Impossible and Learned to Disappear (New York: Carroll & Graf Publishers, 2003). ↑ MSN Encarta, "Magic (conjuring)." Retrieved May 15, 2007. ↑ The Guardian, How Not to Catch a Bullet. Retrieved May 21, 2007. ↑ Magician's Hall of Fame, "Harry Blackstone." Retrieved May 21, 2007. ↑ Mike Falcon, David Copperfield conjures therapeutic magic, USA Today. Retrieved June 23, 2007. Dunninger, Joseph. 1962. The Complete Encyclopedia of Magic. Spring Books. This page was last modified on 5 November 2008, at 04:52.